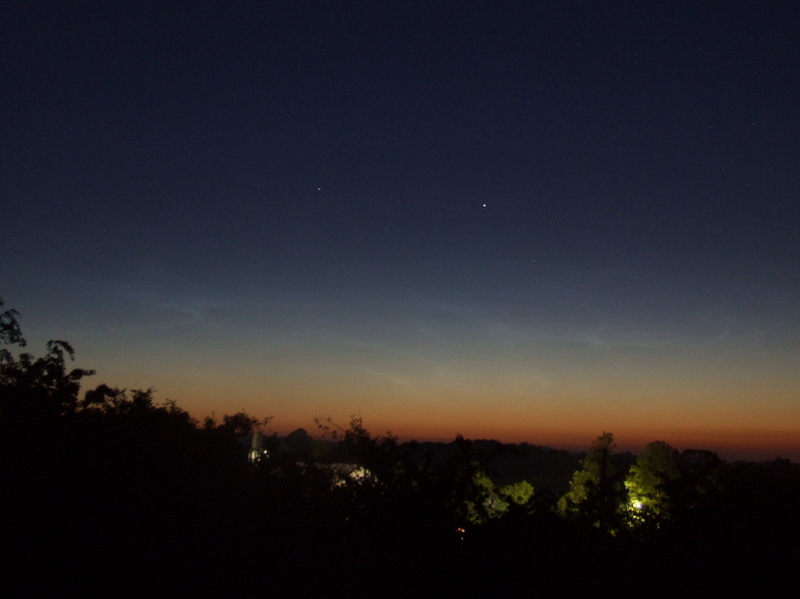 The best display I've seen of Noctilucent Clouds from my house. Abnormally high in the sky, reaching well above the British horizon haze. Photo details: Canon EOS XTi. 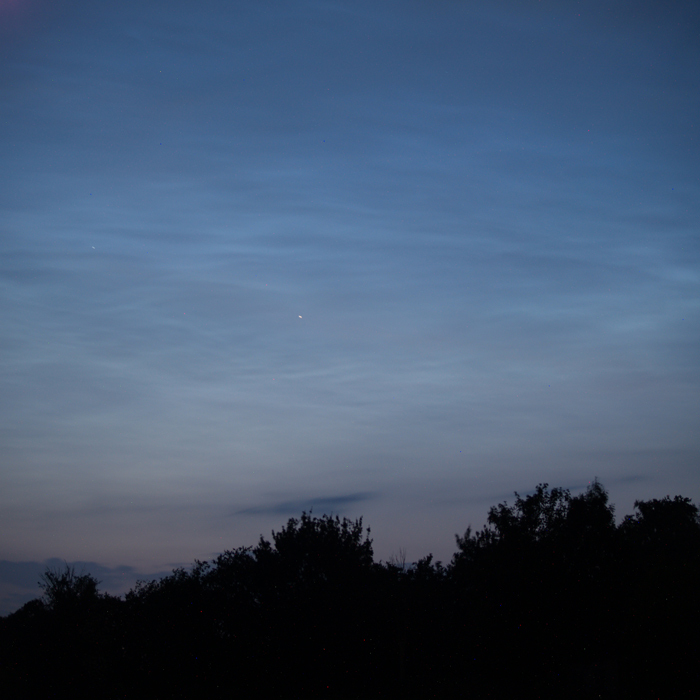 At midnight I took my Nikon 4500 and went outside to shot NLC. It was very low above horizon but bright and slightly twisted. This is a good start to the season with a nice evening display. 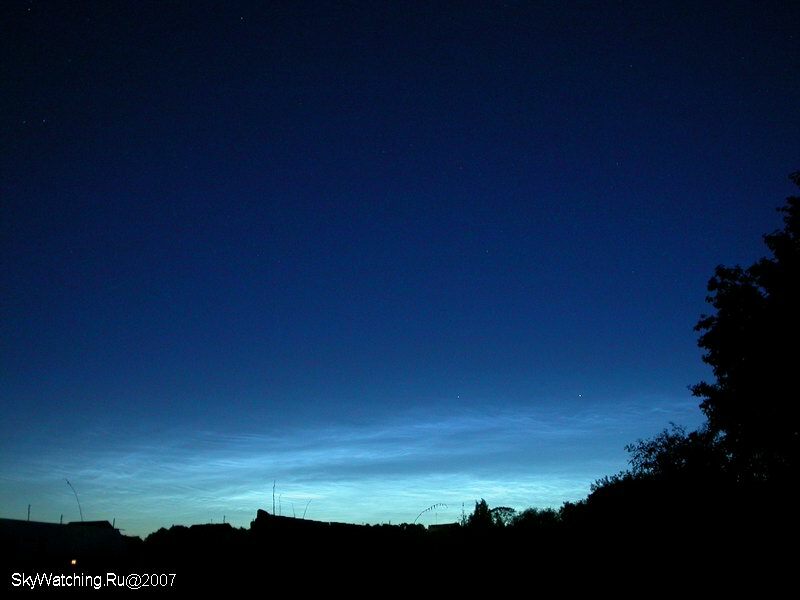 The sun was 11 degrees below the horizon and the bluish tint of the noctilucent cloud was quite distinct compared to the dull brown of lower level cirrus and contrails. 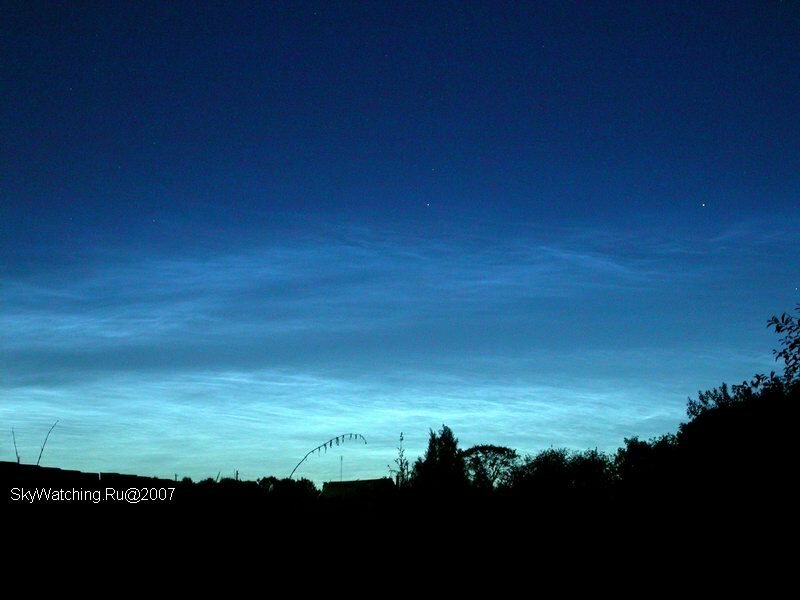 It was the first time I had ever seen a display of noctilucent clouds. They were amazing; the cloud structure was very complex and changed with time. 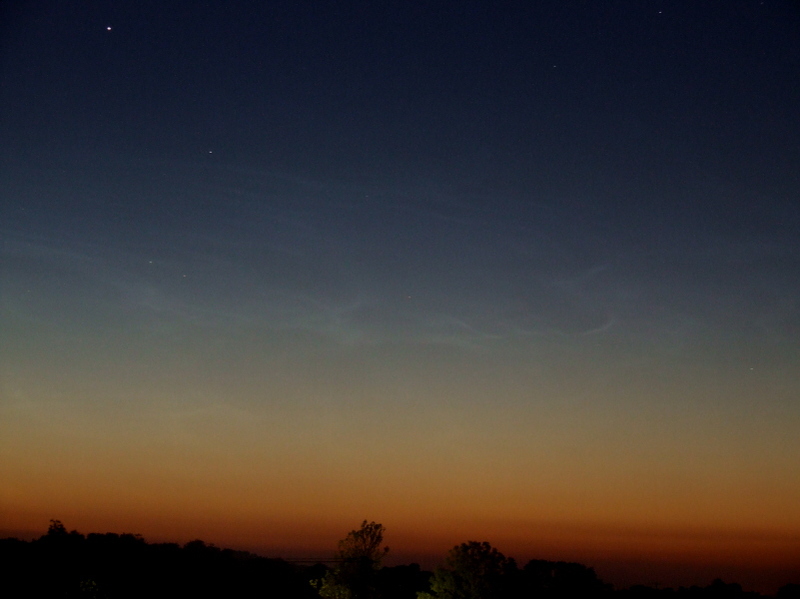 They were easy to make out as they were still illuminated by the Sun whereas other clouds were not. 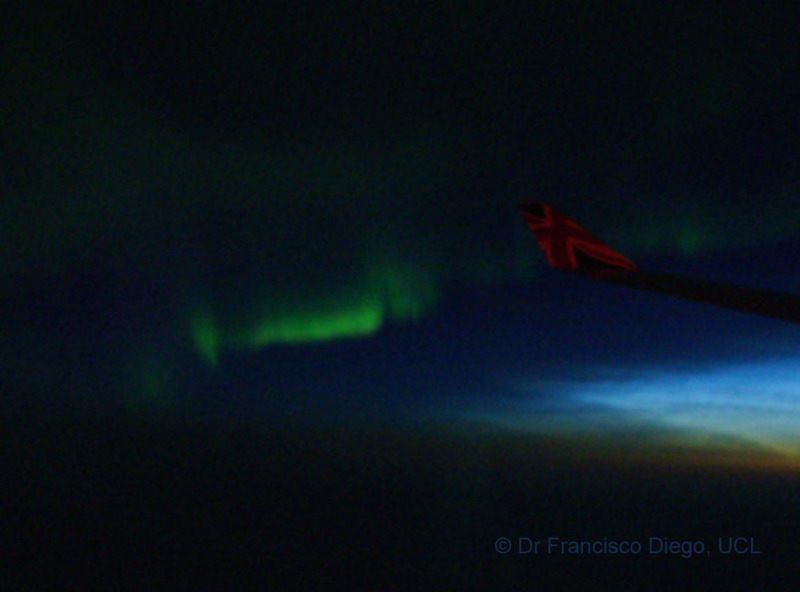 Photo details: Olympus E-500 DSLR, 8 secs, f/3.5, 40mm lens, ISO 100.
flying from Los Angeles to London over Hudson Bay..
Dr. Francisco Diego was flying from Los Angeles to London on June 9th when he looked out the window and witnessed this colorful display over Hudson Bay. On the left is the aurora borealis, caused by charged particles from the sun hitting Earth's upper atmosphere. The color comes from oxygen molecules glowing green on impact. 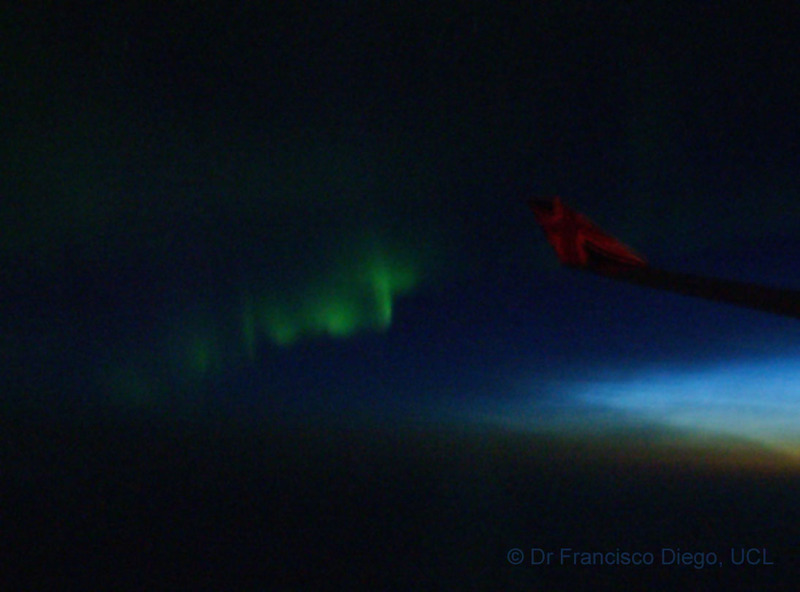 Auroras are located 80 km to 500 km above the ground. 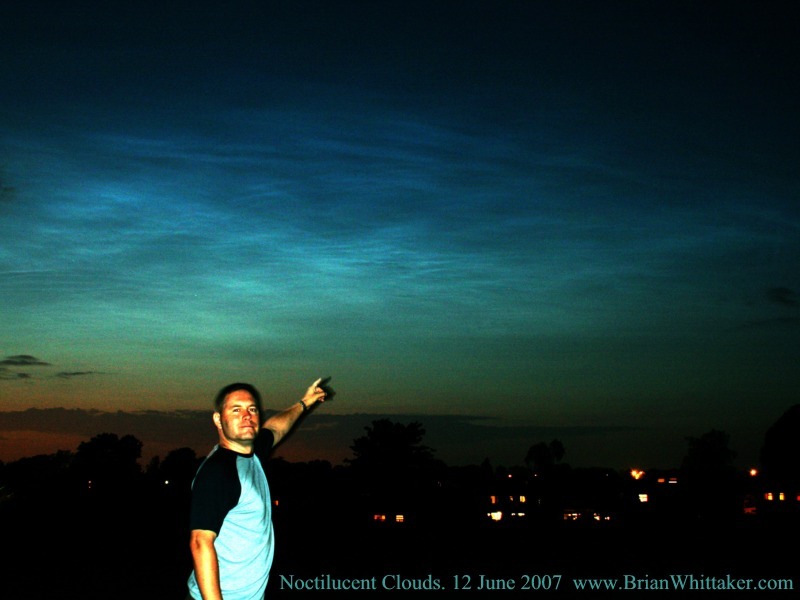 On the right is a bank of electric-blue noctilucent clouds (NLCs), caused by ... what? 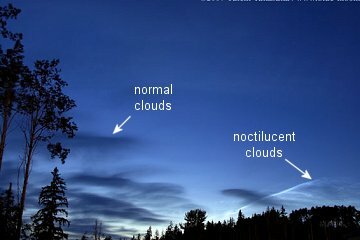 No one knows precisely what causes these clouds; a NASA mission named AIM is in orbit to investigate. 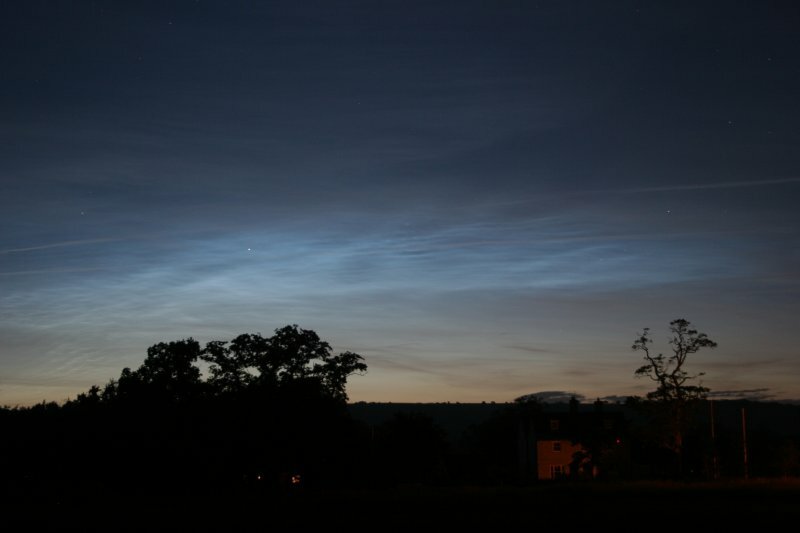 Noctilucent clouds are located about 80 km above the ground. "The aurora was very dynamic. I took three pictures a few seconds apart by pressing a small digital camera against the plane's window and holding it there by hand," says Diego. 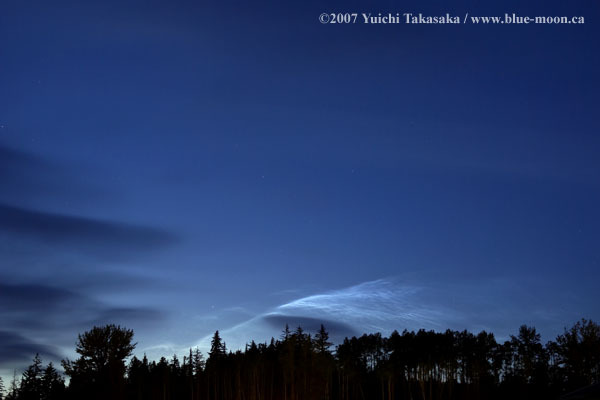 "I went outside on June 8th to look for auroras, but I found these noctilucent clouds instead," reports Yuichi Takasaka of New Aiyansh, British Columbia. 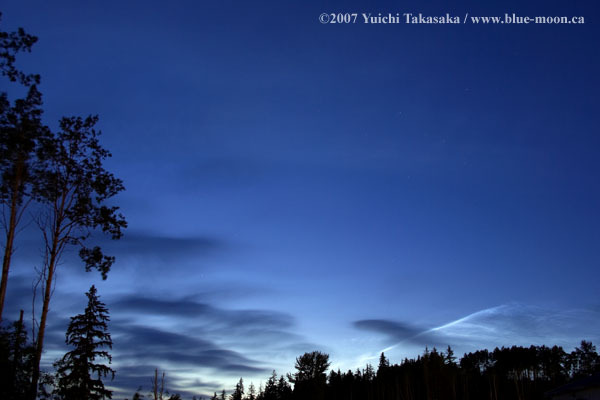 Note the difference in Takasaka's photo between normal clouds and noctilucent clouds: Normal clouds are dark while NLCs glow brightly against the twilight sky. 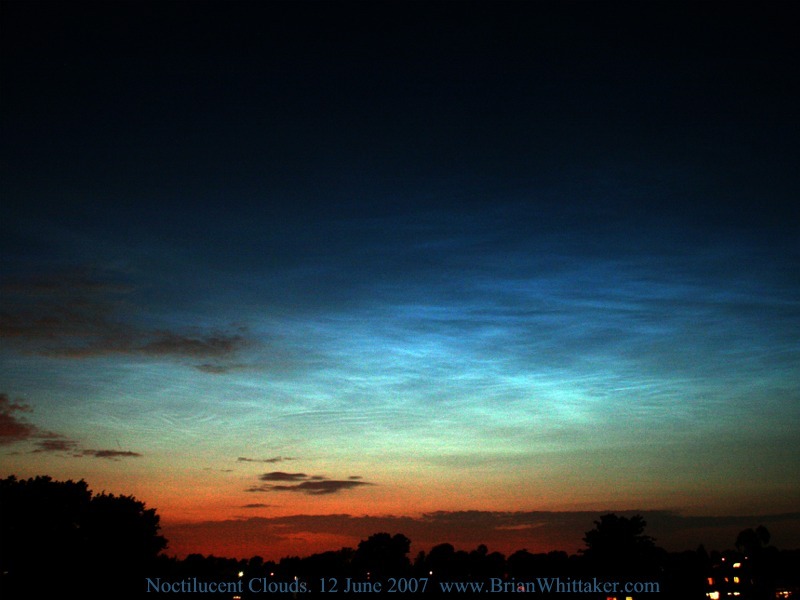 This is because normal clouds hang low in the troposphere, about 10 km high; after sunset they are no longer lit by the sun. 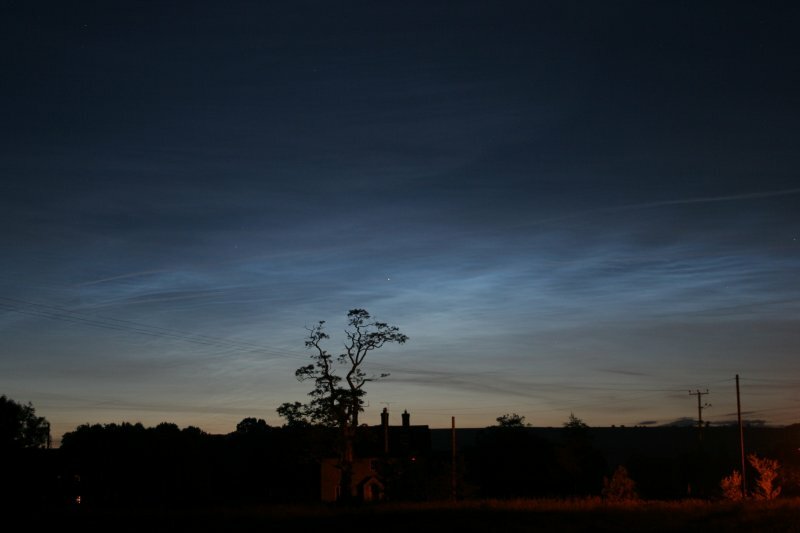 NLCs, on the other hand, float at the very top of Earth's atmosphere, about 80 km high. 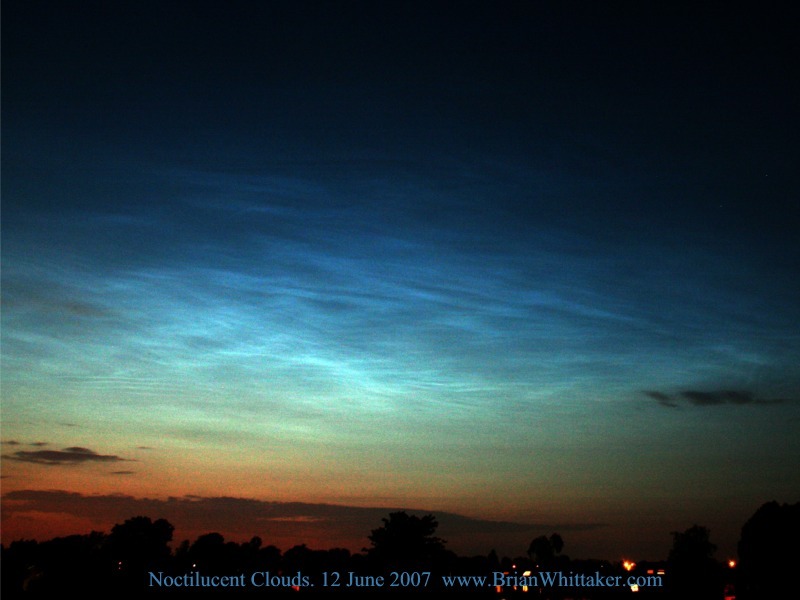 At that altitude, they remain sunlit long after normal clouds go dark. 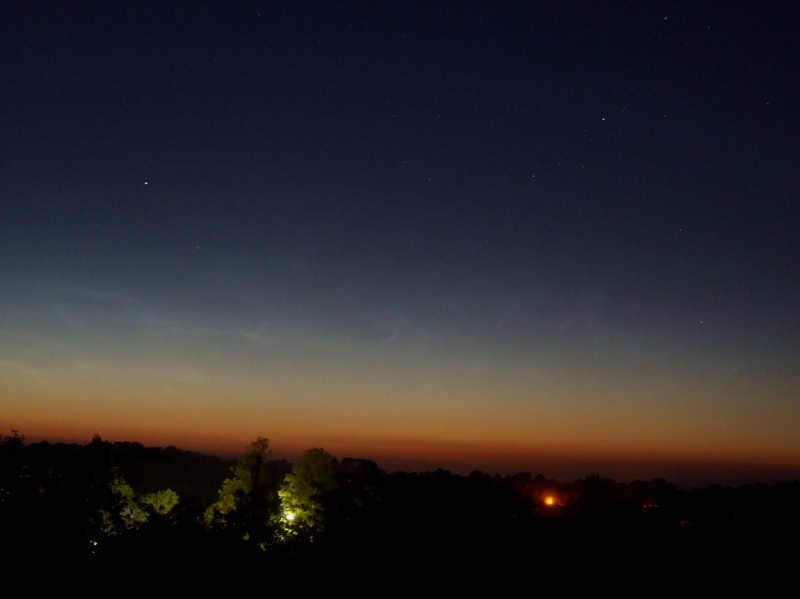 This is a 3 shot panorama of the NLC display - this was approx 25 deg high by over 100 deg wide - the best display so far in the 2007 season. 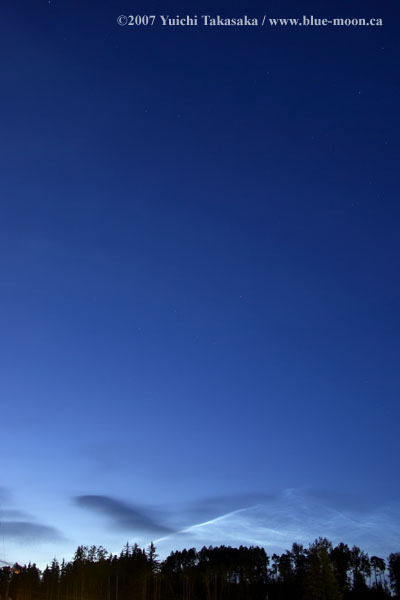 Photo details: Minolta Dynax 5D, 50mm lens, 5 secs, f2.8, ISO 200. 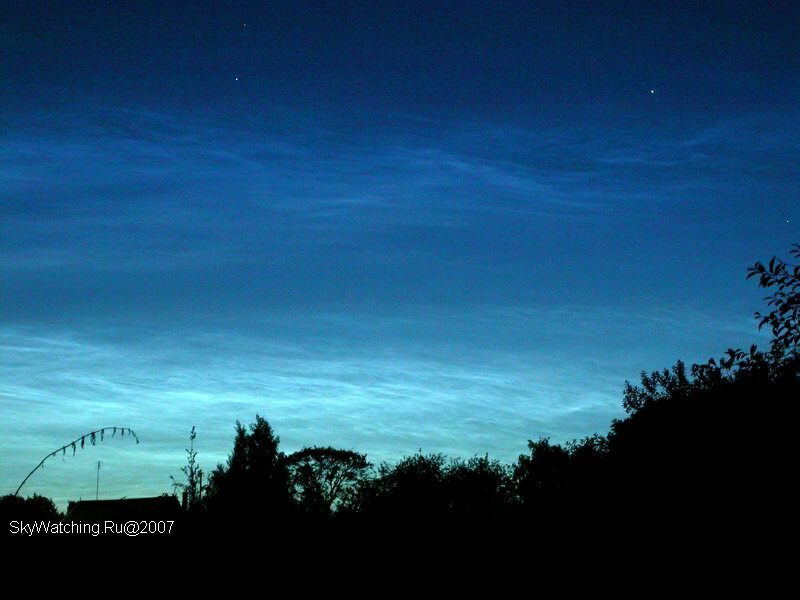 The northern sky is under attack - A beautiful display of Noctilucent Cloud is currently visible as I write these words. Wonderful silvery-blue twisting bands and waves begging for attention below Capella! Photo details: Fuji S5600, 5.1 MP, ISO200, 13 sec exp.